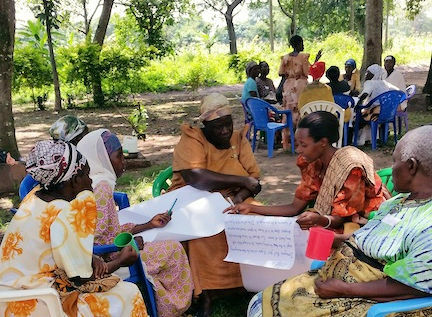 A great deal of the Trust's work, carried out by Lois Pollock on her visits to Uganda, consists in running training sessions, mainly arranged through local partner groups. These are in great demand and she is often confronted with a long wish-list of topics people would like her to cover. Among these are hygiene and health, growing vegetables in sack or keyhole gardens, and running small savings schemes - the latter almost entirely for and by women. Find out more from this leaflet. The Trust is appealing for funds to cover the cost of this training during Lois's planned visit to Uganda in the early autumn of 2017. The cost of an average day’s training is about £200. This includes local transport, training materials, food and drink, plus a proportion of Lois’s air fare to Uganda and board and lodging there. Costs are always kept to a minimum. Lois aims to do 5-7 days’ training on each trip, costing in all about £1,000-£1,400. Click here for an illustrated leaflet describing the sort of training Lois has done in the past. NB: to print the leaflet on A4 paper, set to duplex printing, flipping on short edge. (where GiftAid can be automatically added if you are eligible) or else click here for our Support and Contact page for other ways to donate.